A lot of fans don't pay much attention to the business side of the Star Wars franchise and that's ok. However I for one am interested in it. Some others here are too. 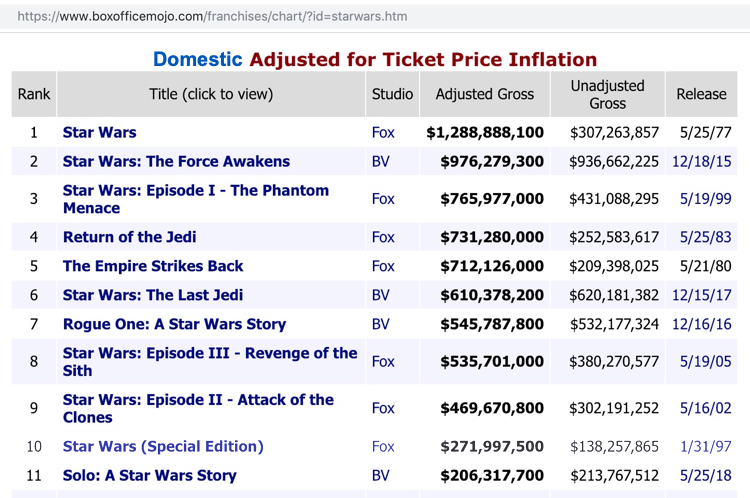 Sometimes some of us refer to Star Wars theatrical grosses so I thought I would put this here for convenience. Box office gross is not an objective measure of quality because there is no such thing as an objective measure of quality. Quality is purely subjective. Only a Sith deals in absolutes (Ha ha I just love that line). Box office gross is one objective measure of popularity, which is the number of people who see quality in a film. The charts below are both from the page at the above URL. For some reason reporting of box office figures tends to default to "Domestic" or "North American" which means USA and Canada combined. The rest of the world is referred to as "Overseas" or "Foreign", and everywhere combined is "Worldwide". Star Wars fandom and business are international phenomena, so Worldwide shouldn't be deemphasized because money is money. The below charts break down each release of each film so I cut off the bottoms for the images, leaving the original releases of all 10 films and the top rerelease in both perspectives (Star Wars SE). 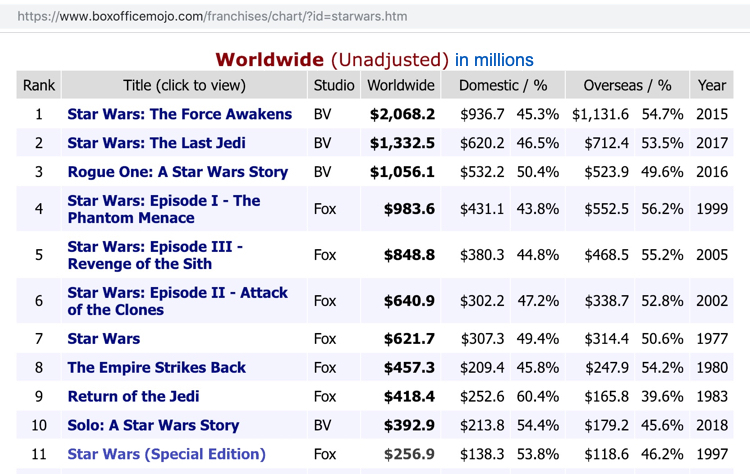 These rankings in the images will be accurate until Episode IX and other Star Wars films come out. The links should be accurate beyond that. The first image is worldwide but does give a breakdown of domestic and overseas for each film. The second image is domestic adjusted for inflation because they didn't make a worldwide adjusted for inflation chart, but it repeats the actual domestic grosses from the first chart. The inflation calculation is based on estimated 2019 inflation. Here are some other links to compare Star Wars to other films. These combine the multiple releases of each film into one film total. I started doing the calculations for inflation, and then I scrolled down and saw you saved me a bunch of work. This is really cool. Thanks for posting. You're welcome. If you ever want to do the calculations for inflation for the worldwide grosses, knock yourself out. They only had adjusted for domestic.